Warren Spragg admits it could be a very long afternoon at high-flying Darlington Mowden Park tomorrow unless his Fylde RFC side improves fast. 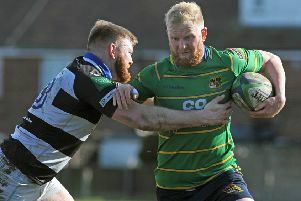 The relegated bottom club are winless since the start of December and shipped 71 points at Bishop’s Stortford last Saturday, whereas their North East hosts are looking to clinch runners-up spot in National One. Head coach Spragg told The Gazette: “It does look as though we are giving out the same message week in, week out and the players, fans and everyone is aware of this, but we are not shying away from anything. “We have a long-term plan to get better and a short-term plan too, and we know that if we play like we did in the second half at Bishop’s it will be a very difficult day at DMP. Spragg is convinced there will be no motivation issues going into the final three games and added: “It isn’t difficult keeping spirits up because our fate is sealed and that makes the next steps clearer. Fylde came out of last weekend’s game with no injury issues. It remains unclear whether winger James Bailey will play again this season due to a knee injury, which Spragg feels will ultimately require surgery. Fleetwood Rugby Club stages its final home game of the season tomorrow and celebrates arguably its proudest moment. League leaders De La Salle visit Melbourne Avenue for a match which will have a huge bearing on the North Lancs /Cumbria League title. The club will also be marking the 25th anniversary of its Provincial Cup triumph at Twickenham. Captain Billy Baxter’s team defeated Hitchin in the April 1993 final to win this national knockout competition for junior clubs. Around 80 of those involved with the club at that time are expected to attend a reunion dinner in the clubhouse tomorrow evening.